It's another beautiful Friday afternoon in Seattle and you're excited to start brainstorming some outdoor activities for the weekend. Maybe some beach volleyball at Alki, a picnic at Gas Works, or stand-up paddle boarding at Greenlake. All awesome options! But guess what Seattle? Your menu of outdoor activities just multiplied! How about hiking amongst the Olympic Mountains at 5,000 feet elevation atop Hurricane Ridge? A riverside hike through old growth forests to the iconic Sol Duc Falls? Or a big lake day? 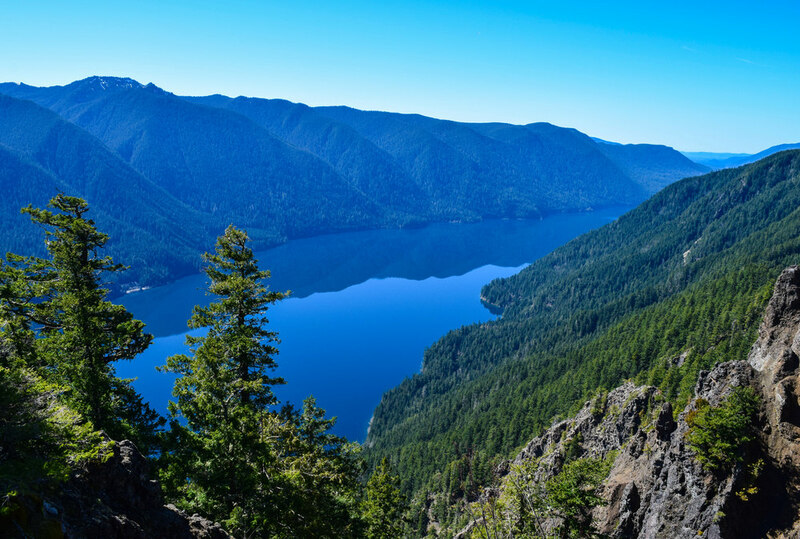 “Big” meaning to explore one of the deepest glacier-fed lakes in Washington State at Lake Crescent. We're excited to introduce our Seattle-based Olympic National Park Group Hiking Tours, creating the ultimate outdoor daytrip from Seattle! Step 1: Gather a group of friends, select an adventure, and make a reservation! Our Seattle-based tours are only $499 for your own private, customized hiking tour of Olympic National Park for up to 11 passengers! This includes shuttle service, a certified hiking guide, and one awesome, adventured filled daytrip. You can select one of our pre-packaged options or call us to create your own custom itinerary! Leave the ferry backups behind! As well as your own vehicle! Arrive at the ferry terminal 15 – 20 minutes early and purchase a walk-on passenger ferry ticket for the Bainbridge Island Ferry. The ticket is only $8.20 per person and it is free for your return sailing to Seattle! Your day of scenic sights begins immediately aboard the Seattle-Bainbridge Ferry. Enjoy sweeping views of the Downtown Seattle skyline, Puget Sound, Alki Beach, and even Mt. Rainier on a clear day. Nothing quite like that fresh sea air in the Pacific Northwest. Your ferry should arrive in Bainbridge right around 8:30 AM and we’ll be waiting for you right at the terminal! After your group checks in, we’ll hit the road and begin our day of Olympic National Park adventures! We will let the photos do the talking. Custom Tour: Add an extra hour and visit Second Beach! Custom Tour: Stay an extra night and visit the most northwestern point at Cape Flattery! After a day full of adventures, we'll head back to Bainbridge Island for the group to catch the 6:30 PM return sailing to Seattle. You will return to Downtown Seattle at approximately 7:05 PM, capping off the ultimate daytrip to Olympic National Park. Want to explore more than a day? We can be flexible with our pick-up times and provide shuttle service to your hotel if you want to book two or more days of private tours! Check out our full listing of guided tours below! Older PostOfficially Announcing the Launch of Olympic National Park Guided Tours!